A long-serving editor of a top-selling regional magazine has been praised by well-known writers Gervais Phinn and Ian McMillan on his retirement. Paul Jackson, who has spent nearly 40 years in journalism, has left his role as editor of the Dalesman after almost 20 years at its helm. He joined the magazine in 1993 after spending nearly 20 years at Bradford and District Newspapers, now owned by Newsquest, where he worked as sports editor at the Keighley News and deputy editor of the Bradford Star. Paul has now been replaced in the role as editor of the Dalesman by Adrian Braddy, who moved to the title after editing the Craven Herald and Pioneer for the past two years and before that the Teesdale Mercury for seven years. 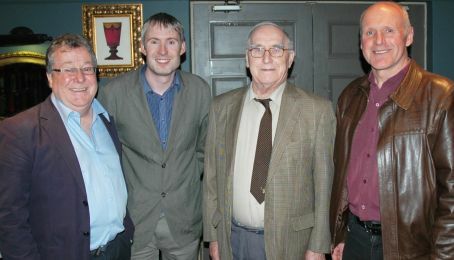 Paul Jackson, left, is pictured with current Dalesman editor Adrian Braddy, second left, and former post-holders Bill Mitchell and Terry Fletcher. At an event to mark his retirement, Paul was presented with a cartoon by Private Eye and Dalesman artist Tony Husband, showing the Huddersfield Town fan scoring the winning FA Cup goal for his beloved Terriers. He also received a poem written for the occasion by Dalesman columnist and TV and radio personality Ian McMillan, while writer Gervais Phinn was also a guest at the event, which took place at the Tempest Arms, Elslack. Four of the Dalesman’s six editors since its formation in 1939 were present and speakers included Dalesman features editor Kevin Hopkinson, also formerly of the Keighley News, who reminisced about their time at the weekly paper. Paul will continue editing Dalesman’s national sister magazine, The Countryman, on a freelance basis from home.